All plants deal with a variety of stresses caused by its surrounding environment. Environmental Oxidative Stress is the stress associated with plant metabolism and plant growth. Plants must constantly adapt to the growing condition of their environment. The stress caused by that environment reduces both quantity and quality of plant growth. As stress occurs, oxygen free radicals accumulate in plant tissue, and if the plant is unable to combat the oxygen free radicals, premature cell degradation occurs. Plants have natural mechanisms to counteract stress. The relative ability of plants to maintain healthy conditions are strongly influenced by factors such as quality of the root system, irrigation efficiency, soil health, nutrient balance, weather, and the quality of integrated pest management practices. Minimize plant stress by addressing basic management and agronomic practices. Redox has four tools that may be beneficial for reducing plant stress when integrated into a comprehensive management program: MAINSTAY Calcium Si, diKaP, Root Rx and OXYCOM Calcium. A reacted plant nutrient product high in calcium and silicon. Mainstay Calcium Si strengthens cell walls and reduces oxidative stress. Plants that grow and develop with stronger cell walls are naturally less susceptible to environmental oxidative stress. Apply 0.25 to 1 gallon via a foliar application during periods of cell development every 1 to 4 weeks or as required. A reacted plant nutrient product high in potassium and phosphorus. diKaP is unique in its ability to promote the production of phenolic compounds. Use of diKaP is particularly beneficial under conditions of environmental oxidative stress. Apply 1 to 4 pounds per acre via foliar or fertigation application every 1 to 4 weeks or as required during periods of stress. A reacted botanical extract plant nutrient product. Root Rx stimulates the production of a broad range of antioxidants in plants. Use of Root Rx is particularly beneficial for improving the quality of root systems under environmental oxidative stress as well as improving the function of the plant vascular system. Apply 0.25 to 1 gallon per acre to the soil every 4 to 8 weeks or as required. A reacted plant nutrient product containing calcium, potassium, phosphorus, oxygen, and proprietary carbon compounds. 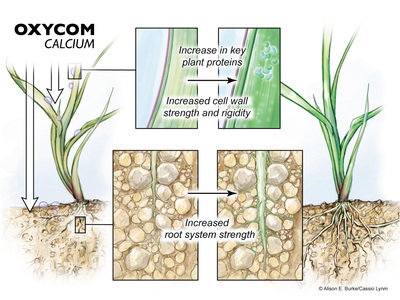 OXYCOM Calcium stimulates the production of a broad range of antioxidant compounds in plants. Increased antioxidant production is particularly beneficial for reduction of environmental oxidative stress. Apply 1 to 4 pounds per acre as a foliar as required during periods of stress.